I'll be honest, right about now I'm getting sick of reviewing tapes. Even though the last few (including today's) are ones that I actually bought myself, give me a slab of wax or even a CD any day over these dumb little things. 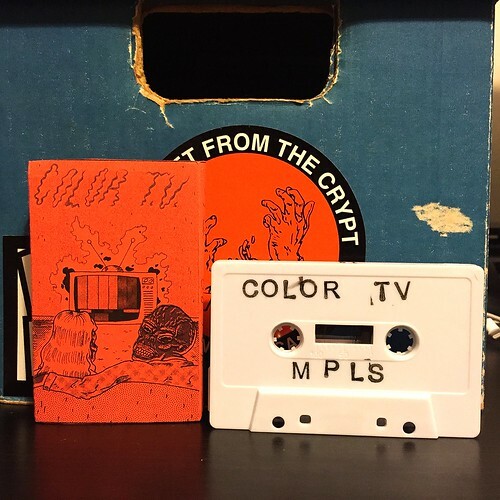 Despite my cassette fatigue, this demo tape from Color T.V. is enough to shake some of my blues away. I hunted down these guys while trying to find out what happened to the band W.H Walker. Those guys released a perfect LP and then just seemed to vanish. My quest (eventually) led me to the Color T.V. Bandcamp page where you can listen to the three songs on this release and order a copy of the tape. Never one to be satisfied with only having digital copies of songs, I of course plunked down for the cassette. While Color T.V. doesn't quite have the same kind of free wheeling, house party stomp, good time vibe of W.H Walker, they have still managed to crank out three songs that I think are pretty incredible. The infectious vibe of W.H. Walker still exists in these songs, but they are a little more straight forward. You have a similar downstroke guitar action like The Marked Men or Chinese Telephones, but the hooks are filtered through a completely different lens. I really, really dig this release and am hopeful to hear more from these guys as soon as possible. Someone should jump on Color T.V. and get some vinyl out ASAP.